A Blues Masters Memorial t-shirt. All the Blues masters who have played at our Blues Masters Concerts and are no longer with us are listed on the front of the shirt. 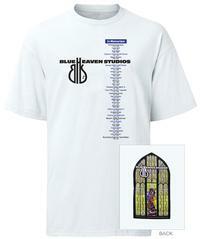 Beautiful depiction on Blue Heaven Studios stained glass window on the back of the shirt. White in sizes S–3X. Comfy 6-ounce; Double-needle coverseamed crewneck; Shoulder-to-shoulder taping.